On Monday, March 12, Eric and Phyllis Watson gave the gift of adoption to four siblings on adoption day. Back in 2015, the Watson’s became foster parents with the potential to adopt; the very next day they learned of four children in need of a home. Two and half years later, the adoption is now official. A heartwarming story! 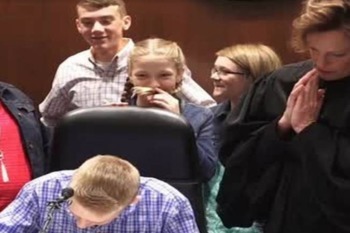 "I order this packed courtroom to give the Watsons a standing ovation," said Judge Kathleen L. Sloan, who struggled to hold back tears as a new family came together. Please share with Triad your remarkable stories of adoption. The article you have shared here very good. Engineer kaise bane This is really interesting information for me Tally kaise sikhe Thanks for sharing! Shocking, splendid site outline! What exactly degree have you been blogging for? you made blogging look straightforward. The general i need a dissertation look of your site is magnificent,and also the substance!. Thankful For Your article.